So far in this series, you’ve decided on a monthly budget, narrowed down a location, and decided on your criteria for a new home … but we haven’t let you go house hunting just yet! You may think that’s crazy, but it isn’t. It’s important to first figure out your answers to each of these three items before you start looking at homes or you could end up with the wrong home for you. 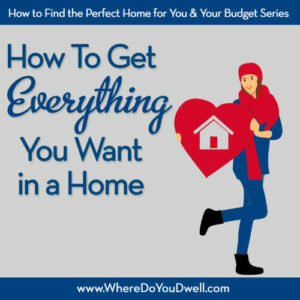 These three – budget, location, and criteria — are intertwined and play a key role in finding the “perfect” home for you. You can get everything you want in a home by understanding how these three items influence each other and need to balance each other out. How each is linked is essential when looking for a home that is affordable, meets your needs, and will satisfy most of your wants. Confused? Here are more details on this process below. When we ask you to “get in alignment” at this point in the home-buying process, we use an analogy of 3 buckets. Each bucket doesn’t have to be equal in “weight” but the total weight combined of the 3 buckets must be aligned or balance the scale they sit on … that is your ultimate goal. Put simply, these three categories—budget, location and criteria—need to be in alignment in order for you to find the right home, in the right location, and be within your budget. So how does this translate to looking for a home? First and foremost, you must understand what you are putting in each bucket and make sure you use this order: budget, location, criteria. That way you’ll be able to house hunt with a plan and a purpose! This order is crucial and that’s why we always tell our clients to first figure out their budget bucket for a new home. Now it’s your turn — BEGIN with what you want to pay per month, THEN know how much cash you have for the purchase, and THEN bring that information to your real estate agent and lender to have them tell you what your price range should be. NOT the other way around, which is what most people do — they decide on a purchase price first and then figure out what that means per month. Doing it that way is a recipe for getting a home that’s too expensive or not something you’ll like. We know you’ll push back on this, but trust us—this is everything to living your best homeowner life! Of all the buckets, it’s important to get this one figured out before you start looking for a home. And then don’t change it until you’ve exhausted adjusting your location and criteria first before deciding to alter your budget. Next, focus on the location bucket. Where do you want to live, and why? What characteristics of that location are important to you? For example, if you love walkability and an easy commute by bike every day, there are plenty of neighborhoods that fit that particular need, even if it’s not the one you originally had in mind. If you’re more of a “house person,” then you can be a bit more flexible with your location since you’re more interested in a home’s aesthetics. Third, focus on the criteria bucket. What do you really need in a home? How long do you plan on living there? What do you want your life to be like during that time period and how will your new home influence this life? Remember, you should have gone through each of these and “filled” each bucket up. For example—if you won’t compromise on location and can’t change your budget, then you must focus on the “criteria” bucket. That means, you might want to consider a fixer upper or a two bedroom plus a basement instead of three bedrooms on the same level. That way you can still have the location and budget that you want most. Can you see how you need to make adjustments and that each “bucket” influences the others? Approaching your home search in this very organized and methodical way may sound silly or boring, but it works. It’s absolutely normal to have this give and take, and you’ll be in your new “home sweet home” in no time! If you ever feel like giving up or are frustrated by the entire home-buying process, don’t forget to think about your home search in this way … three buckets that need to be aligned or balanced on a scale. Still feeling stuck? Ask yourself what you can let go of. Do you really have to have every single thing on your list in this first home? And, if you are still running into trouble, ask yourself how long you’ll be living in this first home. That can add some clarity to what you put in each bucket. For example, it will help define what you really need in this first home in terms of criteria and location, and what can wait for when it’s time to move on up to the next home. We find that the timeline of how long you want to live in your first home often leads people to decide whether or not schools are a factor in their search. That’s what we’ll talk about next week. Stay tuned! You’ve learned how to put it all together by aligning three very important “buckets.” Now you can start house hunting for a home that is perfect for you and for your budget. We’re not done yet with our series though. Next up, What YOU Need to Know When Buying for Schools — this is something every buyer should take into account whether they have kids or not!